To follow the stylistic changes from Gothic times to our own century is to watch the history of art unfold. Not just the grandeur of great fresco cycles and religious architecture, but on a smaller, more intimate scale, within the domestic walls, among the objects men and women used daily. The Gothic style flourished on both sides of the Alps in the 1200-1300-1400s and in the beginning of the 15th century it gave way to a new “modern” style in Florence and central Italy. In conservative objects for church use, it continued well into the 16th century in northern Italy and the rest of Europe. 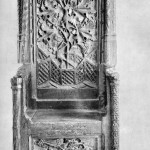 Most surviving furniture in true Gothic style is elaborate, for ceremonial use such as thrones and choir stalls but some small domestic and artistic objects including ivory caskets for jewels and ivory combs have made their way down to our times. These may be decorated with scenes of courtly love , or have allegorical or religious themes. As for the furniture used in the homes, it can divided into two types: those pieces used as containers (chests ,etc) and those built to support or contain the body (chairs,etc). The latter had to retain a similar basic shape but the artisan, influenced by artists and architects, could use his fantasy and follow the new ideas of the time . There was definitely a reciprocal influence between artists constructing cathedrals and those making cabinets. 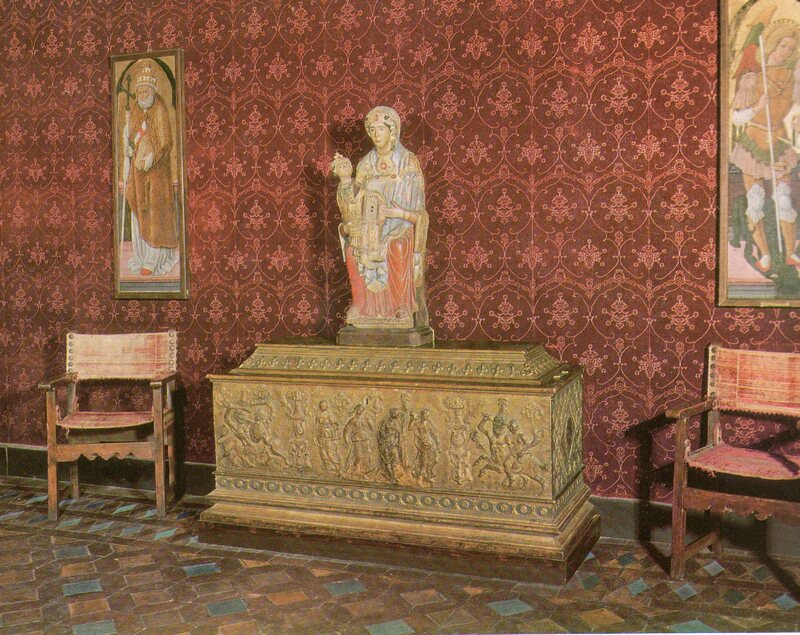 The acute arches, lacy filigree work and pleated parchment motifs can be found in furniture design as well as on the great Gothic cathedrals like that of Orvieto. These same decorations could be done in wood with intricately carved intaglio work or applied with a gesso paste called pastiglia on a wood or canvas base and then gilded or polychromed or as an intarisio or inlay using bits of colored woods, mother of pearl or ivory . 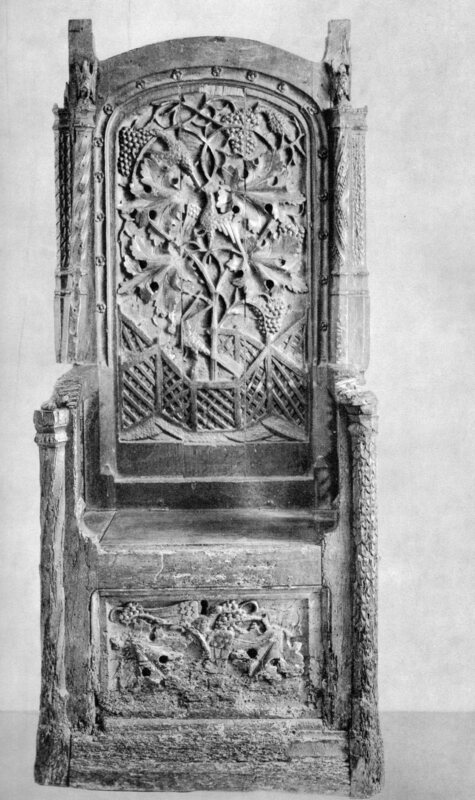 Wood used for furniture included the noble walnut, especially in Tuscany, fir and pine in the north where these woods were (and still are) often used to panel entire rooms. Chestnut and elm were used in more humble, rustic furniture or for parts that did not need to be decorated such as the backs of chests and cupboards. The most outstanding collection of Gothic furniture, that of Dr. Albert Figdor, was dispersed at auction in Vienna in 1930 and today the St. Louis Art Museum has one of the gems of the Figdor collection, the nuptial chest of Isotta da Rimini. 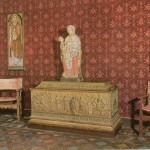 The cassa da suora (nun’s chest) is a primitive surviving example of Gothic chest, an elongated semi cylinder with curved top and front, following the lines of a hollowed-out tree trunk. Often painted directly on the wood were the coat of arms of the family to which the young novice belonged. Similarly shaped military chests, covered in wild boar hide, still complete with fur, can be seen in the amory of the Odescalchi Castle in Bracciano, near Rome. The Italian word for furniture, mobili, is the key word for the days when pieces were few and often moved around. The cassa or trunk was the original hope chest where daughters’ dowries were deposited and added to. Smaller chests were fitted out with ornate metalwork and locks were used as safes for jewels and money when traveling and at home. Pushed against a wall it could serve as a base for smaller pieces like the splendid ivory coffers that the Embriachi workshops fashioned, or even as the base for an emergency bed when placed side by side with a similar chest and covered with straw or wool mattresses. This article is an excerpt from Styles in furniture part 1: Gothic, originally published in 1981. Check my blog-50yearsinItaly– for more articles on antiques. Your comments are most welcome.